These type of vertical-axis wind turbines are quiet, really strong, and don’t require too much wind in order to operate efficiently. I am thinking I may just give building one of these a shot myself! 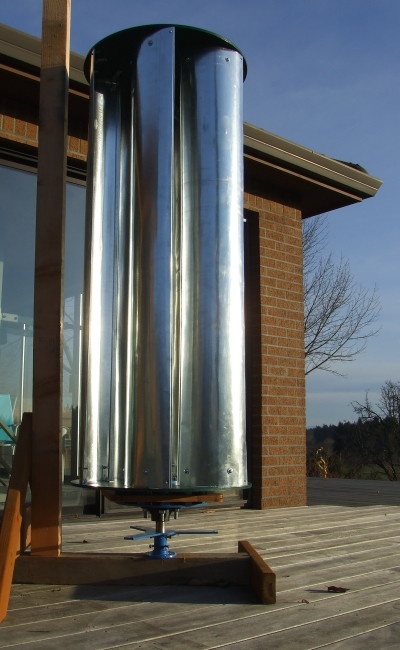 Having looked at the PDF Construction Guide, this diy wind turbine does seem to be relatively simple, but some mechanical know-how would be an advantage. The materials also shouldn’t be too difficult to find in South Africa and the total cost of building one of these would be a fraction of the cost of commercial wind turbines. Wind energy and solar energy are renewable energy sources that have zero carbon emissions and should be utilized whenever possible. Solar energy technology is becoming more efficient an cheaper all the time. The option of ‘off-grid’ living is also easier than ever before; water self-sufficiency is now also attainable with the help of water storage tanks, rainwater harvesting systems and grey water reuse.